Over the years I have accumulated many nature journal entries recorded on notebooking pages. I started off keeping them chronologically in my nature notebook binder but that didn’t make sense after awhile. I would go to look at my list of backyard birds and it would be mixed in with the wildflower notebook pages. I would try to find the list of Yosemite birds and it would be hidden in among my local wildflower pages. You get the idea…it was not very organized. I needed to come up with a way to organize my nature notebook pages in a way that made sense. I needed a system that worked long-term and would keep my treasured memories in a way that I could refer to them easily when desired. Here is what I came up with for my nature notebook. Feel free to adapt my idea in a way that works for your family. This system will work with many styles of notebook pages including those you purchase, make on your own, or print from the Outdoor Hour Challenges. If you start this system with your child’s notebook, they can keep adding to it from year to year with ease. Binder – I use a 1.5 inch size binder and find it easy to take with me when we travel. Cover and spine labels – Make your own or if you have the NotebookingPages.com Treasury membership there are some to print. Now for some visual aids…. I use Post-It tabs to categorize my notebook pages, organizing them so I can easily find a page I am looking for and I can put a few blank pages for future use. I also have sections for places we spend time when we travel. We regularly go to Yosemite, the deserts of California and Arizona, and to Oregon. I found it easier to keep these pages under their own tabs so I can add to them from year to year. I also like to include sheet protectors in my nature notebook binder. I slip a sheet of white paper in and then insert items that I want to save like feathers and pressed flowers. Sheet protectors are also a wonderful way to add miscellaneous artwork to your nature notebook. I sometimes work on watercolor paper for a journal entry and this way I can take it out of the pad and insert it in the proper section in my nature notebook binder. Don’t forget to keep a few generic notebook pages in your binder as well. This will give you a place to record a special find while you are taking your outdoor time. I find it very enjoyable to pull out my notebook and work for a few minutes at the end of an excursion. Being prepared sometimes means the difference between actually completing a nature notebook page and letting the opportunity pass without creating one. Keeping a nature notebook is a joy! It is a treasured record of our family’s outdoor time. I encourage you all to build your own notebook one page at a time and over the years you will have a richer nature study experience and a wonderful keepsake. Many of the pages in our nature journals come from NotebookingPages.com. You can buy the individual sets or you can purchase the Treasury Membership and have access to ALL the notebook pages on NotebookingPages.com. Please note that I am an affiliate for NotebookingPages.com. 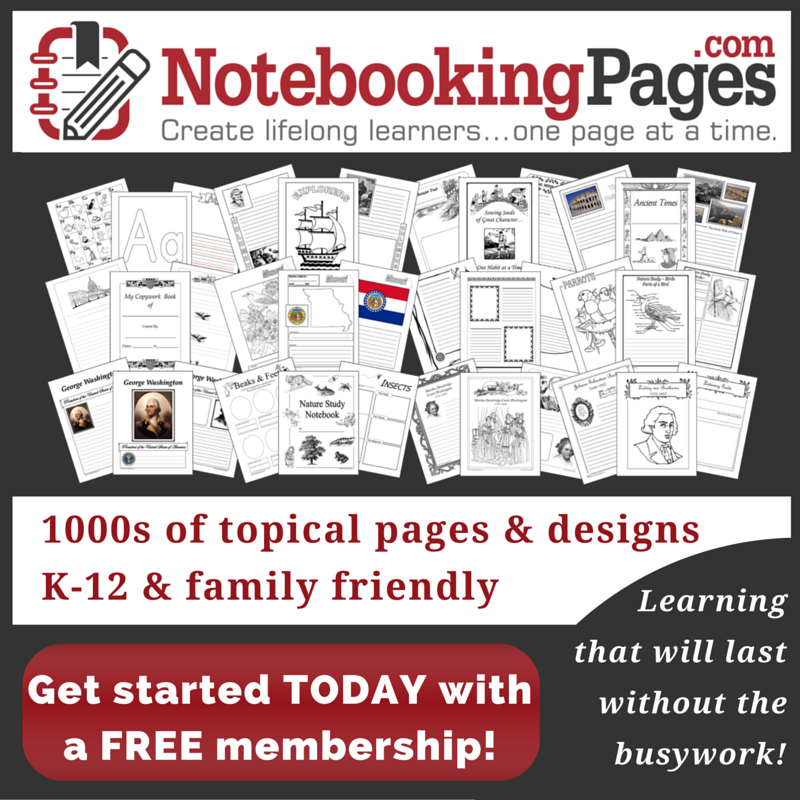 For more information about using notebooking pages with high schoolers, you can see my Squidoo page for lots of specific links, tips, and resources: Notebooking for High Schoolers.. Thank you for this summary of the way you preserve your nature study moments. Papers, pressed flowers and feathers have accumulated since we started only a couple months ago, and I have no organization for them at all right now. They are just piled in scattered places. This would transform all of that into a treasure the whole family could enjoy for years to come. Thank you for this post. I can’t believe I had not thought of this BUT I love it. Makes so much sense. I Love it. Right now, we just have the last two years by ebook. I do have the desire to create a 3 ring binder based on topic . . . desire. . . . desire. Instead of Scrapbook Weekends, we need Notebooking Organization Weekends. . . . .I’ll host the first retreat. I hope it helps keep your pages organized and not bury you in paper. Start where you are and then when you have time, go back and redo. Don’t procrastinate…I learned the hard way. My boys pages are in about 10 different binders and I would love to pull them all out and redo them but it seems sort of overwhelming. I enjoyed doing my own though…very therapeutic. Very practical and motivating!! I’m wondering if you saw my binders and stacks… Thank you for the tips. Thank you so much for this post Barb. Currently my girls notebook pages are in their yearly work files and I was wondering what to do with them towards the end of the year as I don’t want them being lost in the piles of past years work. Of course it seems like such an obvious solution – creating an ongoing nature binder. How silly of me not to think of it! Love this, thanks so much! I have been wondering what to do with all the leaves and feathers we’ve collected and trying to find a way to incorporate some of the things we’ve found from other countries. This is perfect!